Osa Palmas Canopy Tour This Canopy Zip Lining is located in La Palma, which is about 30 minutes by car from Puerto Jimenez or 1 hour and 15 minutes from Matapalo. 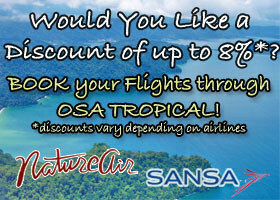 Osa Palma’ canopy tour consists 6 lines and 8 Platforms which vary in height from 10 to 35 meters over tree tops of the jungle. The canopy zip-lines are set up as an “adrenaline” tour – which means that each cable is faster than the previous one. 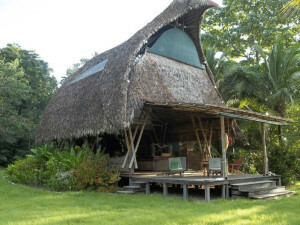 You start the tour close to the main building which is a big Rancho nested on the top of a hill that overlooks the Golfo Dulce and the mountains. There is one short 15-20 minutes hike from one platform to another (only once). The Tour includes certified Gear and Insurance, Professional guides, Bottled water and fruit at the end of the tour. The total Zip Line distance is 1,500 meters and the tour takes 1.5 hours. 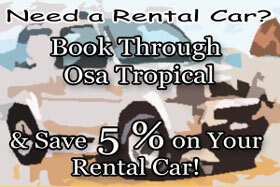 The tour cost per person varies whether you need roundtrip transportation from and to Puerto Jimenez or not. If you get there by yourselves then the tour cost $40.00 per person or if you want to have a roundtrip transportation from/to Pto. Jimenez town then the tour cost $50.00 per person (on a 2 people minimum). The tour needs to be booked at least one day in advance. There are two locations of this canopy tour company – one in Miramar of Puerto Jimenez and one in the Adas Mountain in Golfito. 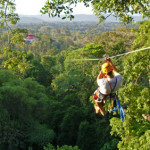 The Puerto Jimenez canopy zip-line tour is about 20 minutes from Puerto Jimenez or 50 minutes from Matapalo. They have 8 Platforms. You start the tour at the Miramar road entrance where you will be picked up by the guide and taken to the first Platform. The total Zip Line distance is 1,200 meters and the tour takes 2 hours. The Tour includes certified Gear and Insurance, Professional guides. The tour cost is $75.00 per person. The tour needs to be booked at least one day in advance. 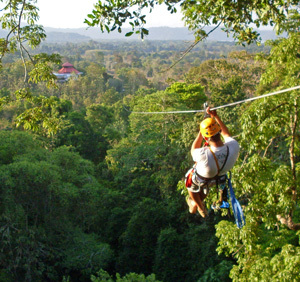 The Golfito canopy tour is located in the Adas mountain in Golfito. In order to get to Golfito you need to take a lancha from Puerto Jimenez across the gulf. There you will be met by the guide at the town dock in Golfito and taken the canopy spot. They have 13 Platforms. The total Zip Line distance is 3,000 meters and the tour takes 2.5 hours. The Tour includes certified Gear and Insurance, Professional guides. The tour cost is $75.00 per person. The tour needs to be booked at least one day in advance. This tour has an optional Waterfall hike that takes another hour and if you want to do it then there is an extra cost of $25.00 per person. Ground transfers and boat ride back and for from Jimenez are not included in the cost of the tour.